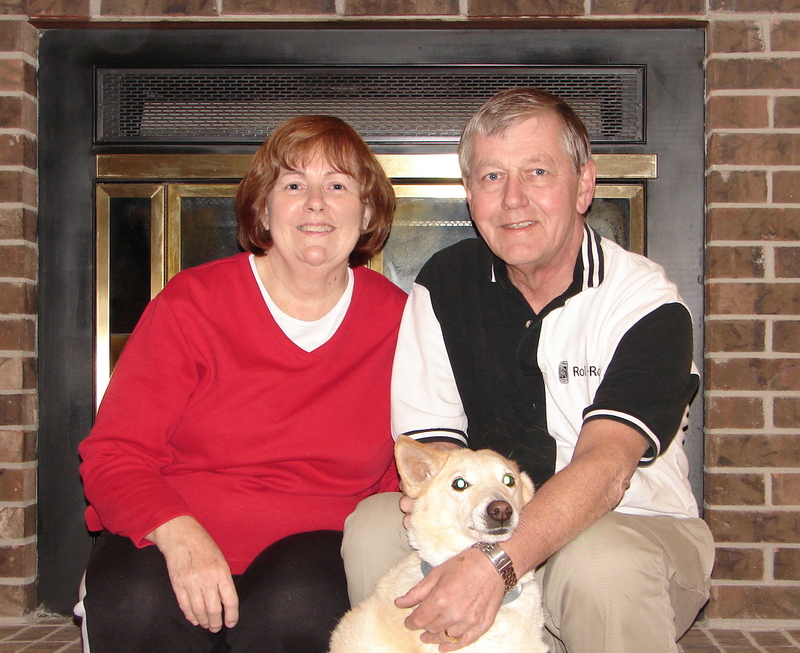 Bill and I were living with a family of two full-time working parents with two full-time school and activity busy children; two dogs (one failing 16-1/2 yr old and one 2-1/2 yr old), a guinea pig, a rat, and two beta fish. In addition to what Bill and I try to contribute to our multigenerational living arrangements, we also had so much going on with housebuilding decisions, Goldie’s health, the movers, and finding storage for all our “stuff.” The only thing we could do was greet each day with a smile and a prayer and plow through it the way we always do . . . by working hard . . . Bill taking over the physical labor work, along with spreadsheet analyzing; me taking care of the family with laundry, cooking, dishes, along with organizing all the housebuilding paperwork and communicating with the bank. These are the roles we know and feel comfortable in. Wednesday (Aug. 13) morning Bill got a call from the area manager of the moving company to tell us that the three moving vans headed our way were delayed. They had run into stalled traffic on the highway and then one of the drivers became ill and they had to swap out people. We were told to expect the first truck to arrive around 11:00 am. 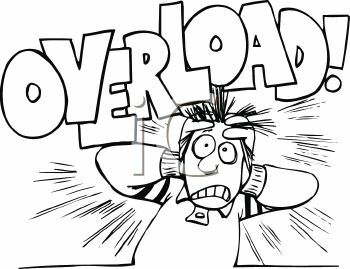 That gave Bill several hours to work on creating a “builder versus our subcontracting bids comparison spreadsheet” and start entering info. I took off for the grocery to buy a variety of drinks and ice for the moving crew. A little before 11:00, Bill went back down to the pole barn to wait for the movers. He called me when the first moving truck arrived and I came down. We decided that we both needed to be down there to help manage where we wanted house and workshop items to be stored in the pole barn and check condition of items as they came off the truck. 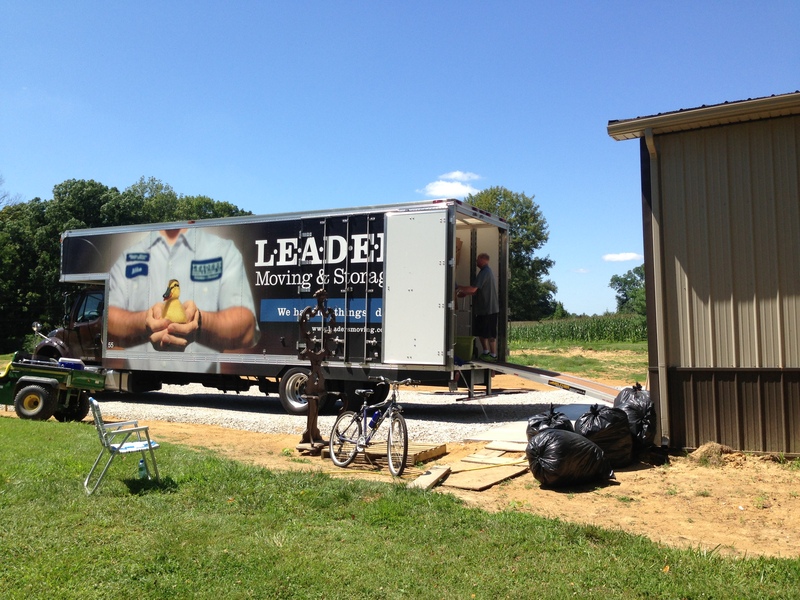 We had 9 movers and 6 trucks the day we moved out of our home in Central Indiana in early June. 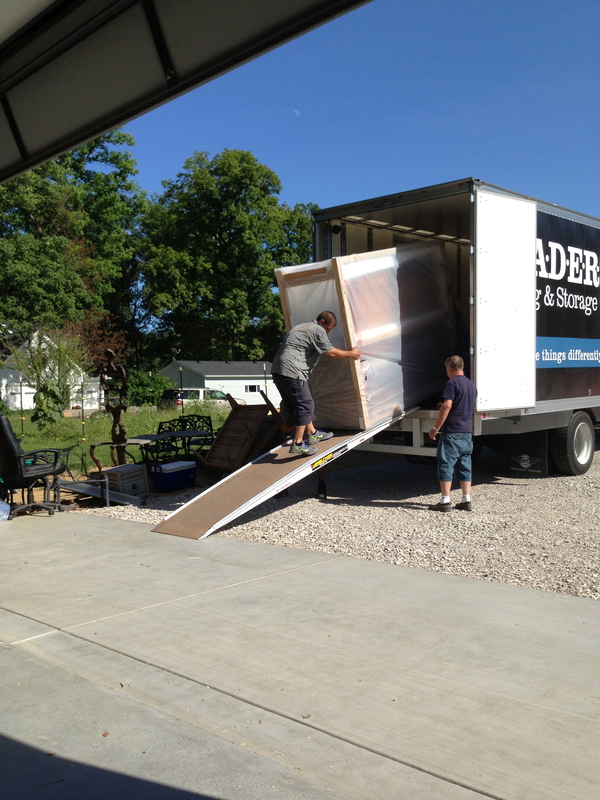 This day we had 3 movers and 3 trucks! This was gonna be a long day. But, I had enough cold drinks to satisfy an army! The first truck arrived about 1-1/2 before the other two trucks made it. One guy started to unload it all. Bill had a lawn chair set up for me to sit and watch. As soon as the mover unloaded Bill’s workshop swivel chair, Bill plopped himself down and supervised. 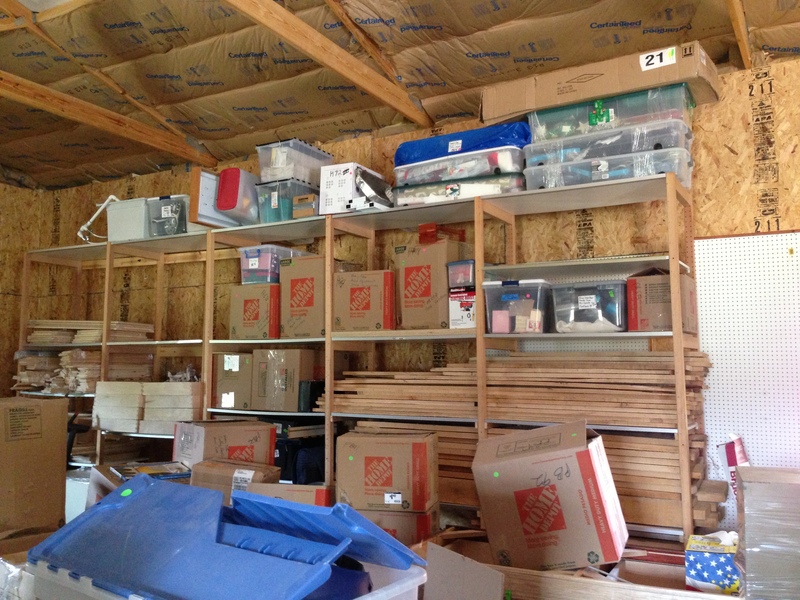 The plan was to put house stuff on the Right of the pole barn and workshop stuff on the Left. 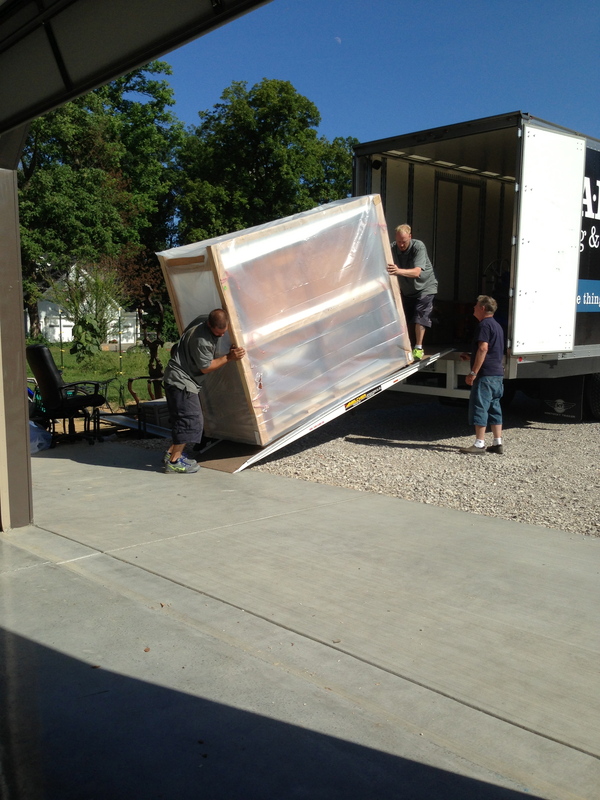 The other two trucks arrived and the three movers worked together to start unloading furniture. Couch – a place for me to sit and watch! As the afternoon was coming to a close, there was one last item to be moved from the last truck. And, it was gonna be a bear to get down that ramp. It was the huge crate Bill had built to house our large king size canopy bed. Neither one of us had seen how they had moved it from our other house and none of the present movers were part of that moving crew. After the movers shuffled a few things around in the pole barn to make room for the crate, they started to manipulate the crate toward the ramp. The wheels were hanging over the ramp! 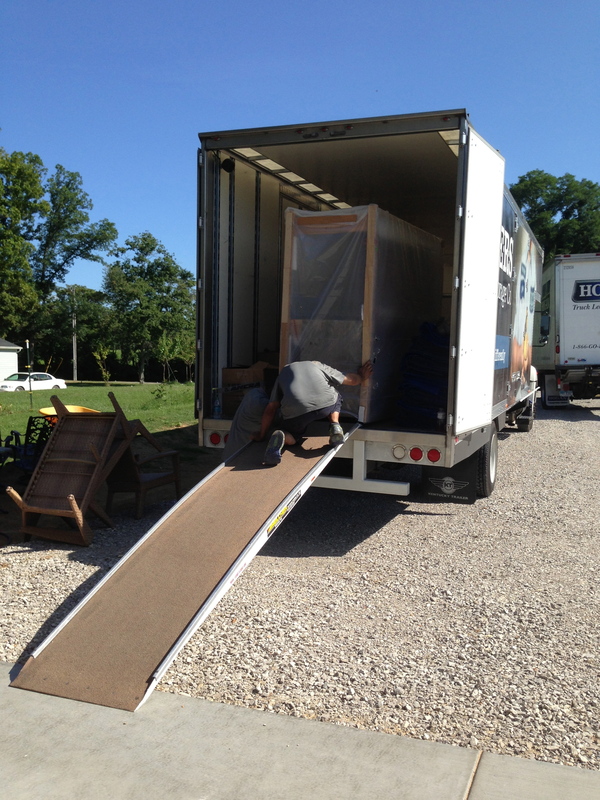 The movers would have to try to steady the crate as it was being pushed and pulled down the ramp without the help of the wheels. It was the scariest thing I ever watched. I was so afraid the crate would fall over on them. Bill was staying close to make sure it wasn’t damaged in the move down the ramp. Of course, I didn’t want him standing so close! The sighs of relief were audible all around! The guys wheeled the crate inside the pole barn and there wasn’t much room to spare. Here is what the pole barn looked like right before we shut the garage doors for the night! It was exhausting being a chair-side supervisor! 😀 We were wiped out by the time evening rolled around. This was one night I think we planned to have leftovers for dinner. The next day (Thursday, August 15) was a really tough one. It was the day we said goodbye to our Goldie Girl. This is a favorite pic of her in her better years. This is how we want to remember her. We don’t want to remember her how she was the last several months . . . old (almost 17 years old! ), confused, anxious, arthritis-ridden in her back legs and hip, out of breath, deaf, eyes swollen from allergies, walking sideways, and having accidents. It’s hard to make a decision to let a part of your family go. My sister Vicki visited the week before and loved on Goldie while she was here. All of my six sisters have a closeness with Goldie Girl. You see, on one of our Sisters Weekends 14 years ago Goldie “lived” with me and my sisters that weekend in our cabin. She was an abandoned dog and the owners of the lake retreat asked if anyone would want to adopt her. You could say Goldie adopted us. My sisters named her Goldie. I was toying with the idea of getting another dog, so I bought a collar and leash and brought her home with me without telling Bill. I had no cell service at the cabin retreat so it was a surprise when I introduced Goldie to Bill. Bill wasn’t too keen on the idea of another dog at the time; however, Goldie quickly won him over and became “his” dog ever since. Vicki asked if Goldie might have had a stroke because of the walking sideways (off-balance thing) and the confusion. Who knows. 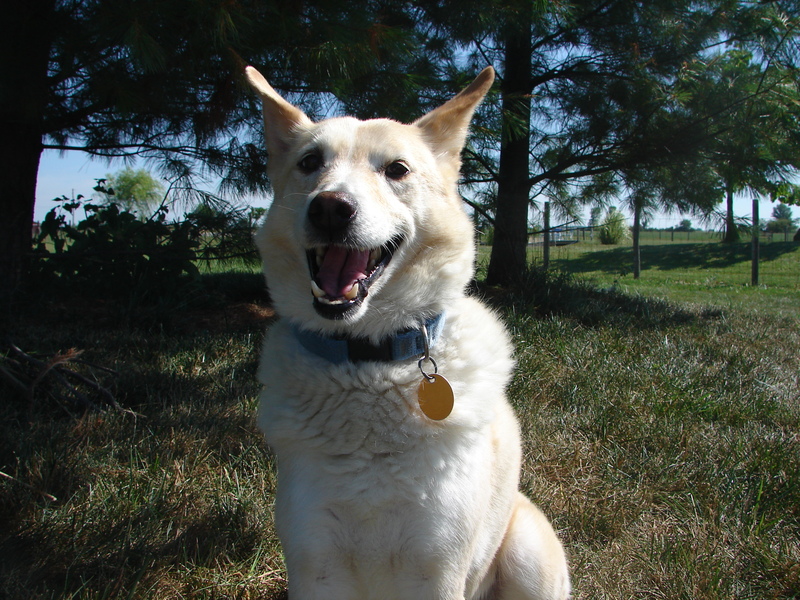 Vicki shared I might want to check about dealing with senile dogs online and see what they suggested. After Vicki’s visit, I did check several websites. It appeared that Goldie had almost every symptom of Cognitive Dysfunction Syndrome (similar to Alzheimer’s disease in people). It appeared from what I read that she would continue to just get worse. I called my friend Ann to talk to her about Goldie. Ann is my expert on animals and animal behavior. She asked a lot of questions and finally asked the dreaded one – were we ready to let Goldie go? I told her as much as I didn’t want to, I was ready. I thought Goldie’s quality of life was not good. Then she asked – what about Bill? I told her that I did not think Bill was ready yet. That evening I talked with Bill and we decided we would watch to see if Goldie got any worse, and if she did, we would make a decision then. So, fast forward a week . . . Bill took Goldie outside Thursday, August 15, morning. As soon as he got back upstairs, Bill looked at me with tears in his eyes and said, “It’s time.” I said I would call the vet and see if we could bring her in. Bill told me he could not go to the vet with me. He said when we had to put Rusty down 12 years earlier it was too hard and he just couldn’t go this time . . . especially since it was Goldie. As soon as I started to explain to the vet office what was going on, I started to cry on the phone. They made an appointment for later that morning. When I told Bill he would have to help me get Goldie into the car, I started crying. Then Bill said he would go with me but would not be able to go into the treatment room. The rest was hard. I told Jill what we were going to have to do later that morning and asked if she wanted to tell the grandkids so they could say goodbye. Megan and Jack cried and I felt bad sending them off to school afterwards, but they each and Jill spent time with Goldie before they left. I stayed with Goldie through to the end. It was peaceful. She was no longer in pain or confused. 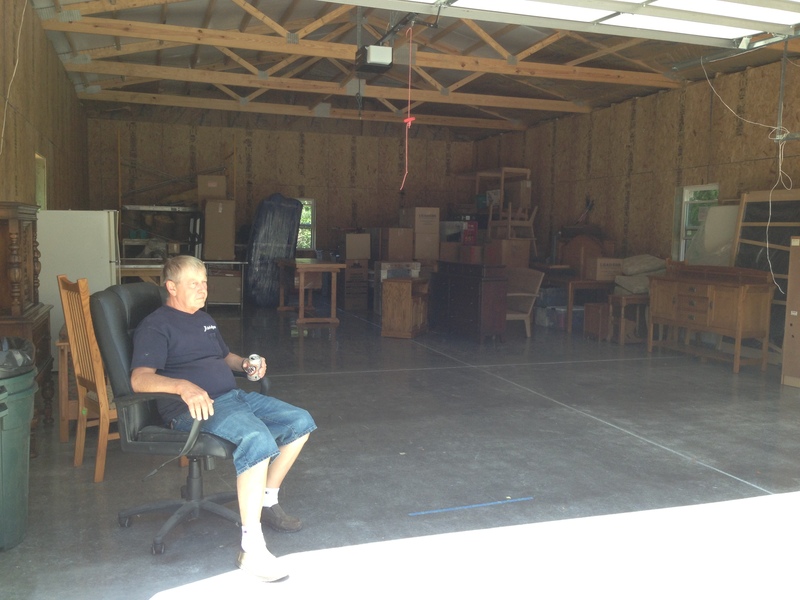 When we got back home Bill immediately went to work with Marty to start moving stuff out of the pole barn into two storage units he had rented down here – one was conditioned and one was unconditioned. This became a theme for Bill and Marty for days and days. And, through this process I would periodically come down and tell Bill what stuff I wanted to keep in the pole barn and what could go to storage. We got out our inventory list and marked off which boxes went where. It was overwhelming. I didn’t handle it well so I stayed away. Poor Bill. It was so hot. He has lost the rest of the weight he wanted to lose and he is fit and trim these days. And me, on the other hand, I don’t like sweating off my weight so I’ve not done as well. 🙂 Besides, I prefer going to the Y for the water aerobics. 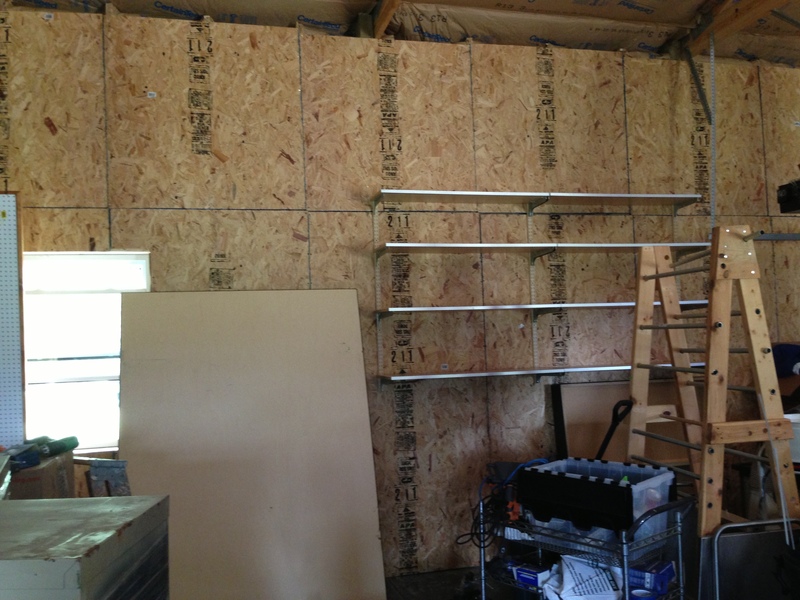 Bill has managed to get shelves up in the pole barn and moved wood for the cabinets and other items up on them. He even got one of his peg boards up. Apparently, we did not receive the construction loan application denial letters on Wednesday, August 14. I was mistaken. 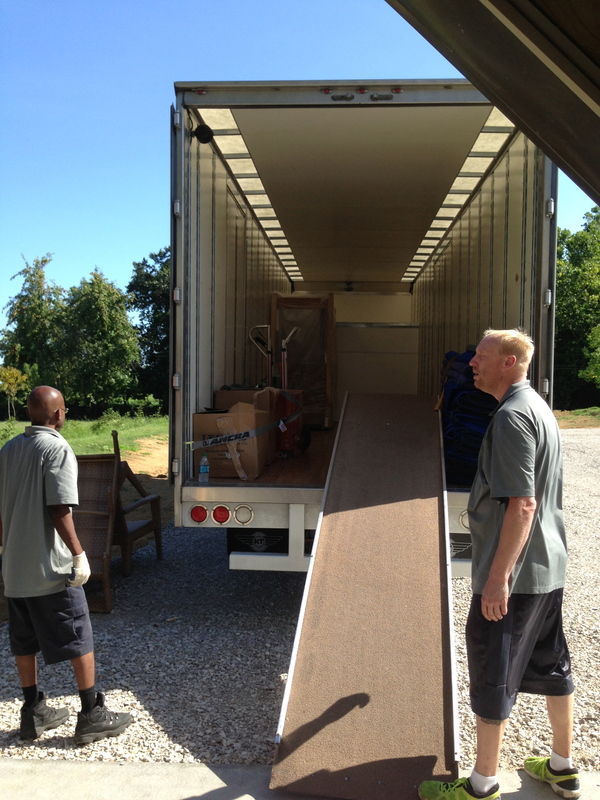 We received them on Friday, August 16. So you can imagine the state of mind we were in after the last two days we had. I had picked up the kids from the bus stop and grabbed the mail. I called Bill and he took a break from moving stuff and came up to the house. We made a call to our loan originator. She was shocked and knew nothing about it. 😯 She said she would try and find out what was going on. But, it was a Friday and towards the end of the work day. We waited about an hour before Sherry our loan person called us back. She said from what she and her boss could figure out the loan processor had royally messed up. They had used $$ figures that were incorrect AND they were supposed to have held the application until we had a signed contract with a builder AND an appraisal. She said not to worry (yeah, right) and they’d get it all figured out the first of next week. Bill and I were becoming so frustrating. We knew building a house would bring a lot of stress, but this was more than we had bargained for. It’s not just the housebuilding. It’s everything that goes with it. 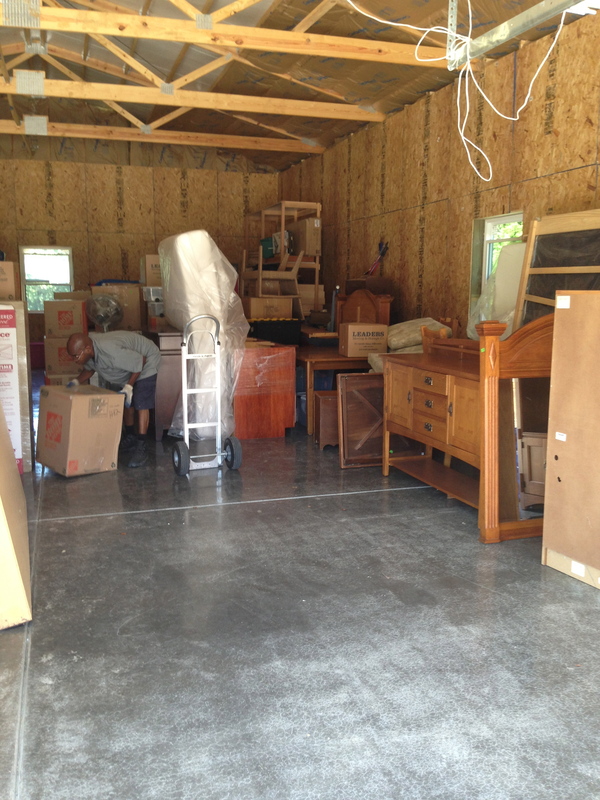 Moving and storage. And the questions the bank and underwriters have! Getting a loan is not like it used to be. Our credit score is in the Excellent range but we have to explain every little thing that shows up on a credit report. I understand the restrictions. But sometimes you feel like you are being accused of doing something wrong. We had to explain how the movers charged our credit card twice and how our credit card company credited us and charged us four times for the same credit!!! We are talking thousands of dollars. We didn’t do anything wrong – the moving company and credit card company were at fault. But, we got the job of trying to explain it all to the bank. Crazy. Try explaining about charging new appliances on a new credit card, paying it totally off the first bill we get, and then when the store gave us a $100 credit on those appliances a month later – it showed up as a new inquiry for another credit card. Huh???? We didn’t apply for another card. The company just sent us a check for the $100 credit because we haven’t used the credit card again. I keep records of everything. And, believe me, the bank has asked for every bit of it! Word of advice – document everything. Next up: So what did we decide about building the house – Builder or Subbing it Ourselves? Did the bank get things straightened out? My goodness, it’s been a long time since I posted. That time has been filled with a lot of hurry up and wait. 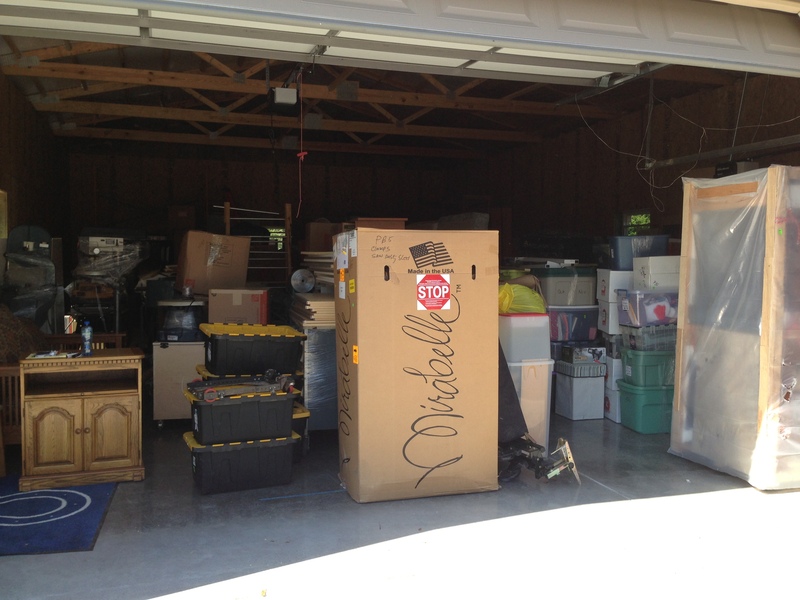 And, during the wait times, we’ve been quite busy with the family and moving stuff from one storage to another! Let’s see . . . when I left you we were still waiting for the builder. Waiting . . . waiting . . . waiting . . . He took forever! 😡 Finally, on Wednesday, August 7, Jim text us from Hawaii that he had gotten a call from the builder but it was in the middle of the night (time difference!). Jim said he called him back but got his voice mail. Builder did not call Jim back. Finally we text Jim and asked if we could call the builder and talk with him. Jim said yes. To be honest with you, I cannot remember if we talked with the builder on Friday, Aug. 9, or Monday, Aug. 12. But, we did get to talk to him first thing one of those mornings. He still really wanted to sit down with Jim and us to discuss everything. We said that was fine, but asked if he could give us a verbal estimate over the phone first. Honestly, we were so tired of waiting. It had been 5 weeks! And, I kept thinking of those grains of sand slowly emptying out of the timer. The builder gave us a price. It was about $15,000 less than our price and that included his management fee. We were definitely interested at that point. We set up a meeting with him and Jim for the afternoon after Jill and Jim returned home from their trip, Tuesday, August 13. We really wanted to get our house started. 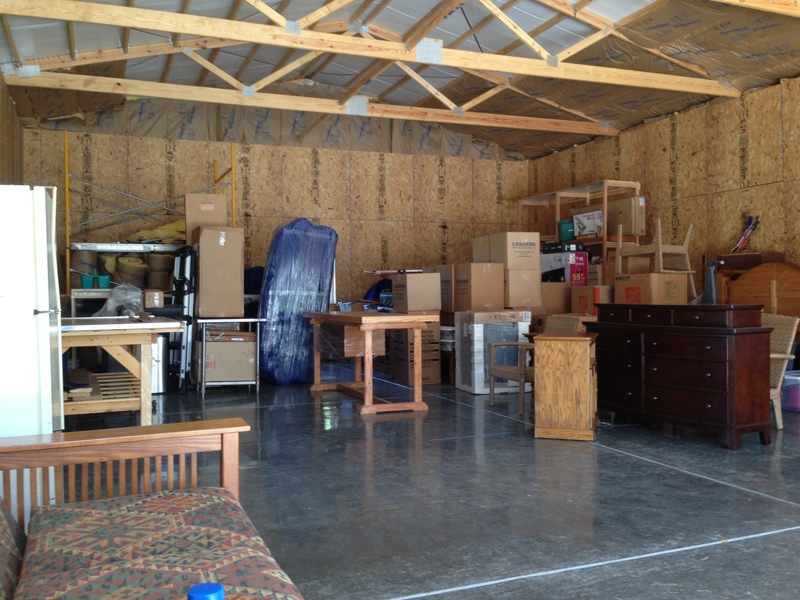 The week before our movers called and wanted to know when they could move our stuff from storage down to our pole barn. Bill decided that he would kick things in high gear to get the pole barn insulated and walls up and therefore, he scheduled all of our belongings to be moved on Wednesday, August 14. Marty, the college student, said he would help Bill. They worked some long days, but they got all the walls insulated and interior walls installed. They also got part of the ceiling insulated. The rest will have to wait until a later date. Here are some pics of their progress. Our meeting with the builder was scheduled for 5:00 pm on Tuesday. Let me give you a run-down of what that day was like before the meeting. Bill and Marty worked in 90 degree heat in the pole barn and finished the insulation and walls just in time for Bill to shower and head for our meeting. Marty spent the rest of the evening organizing and stacking what was left in the pole barn so we would be ready for the movers the following morning. While Bill was in the pole barn, I was with the grandkids getting them ready for their first day of school the next day. We ended up having to buy a bunch of new school supplies that Jack’s teacher had emailed Jill while they were in Hawaii. Who wants to be out shopping for school supplies the day before school starts? 🙄 We also had to pick up lunch supplies and stop at the library. I got home about a half hour before Bill finished in the barn. Jim and Jill were delayed getting home from Hawaii Monday evening and didn’t get home until about midnight. Jim got up early on Tuesday and headed for work – probably about 5:30. Jetlagged and with little sleep Jim worked a full day after being gone from work for almost two weeks. Can you imagine how three of the four people felt when the 5:00 pm meeting started on Tuesday? We all perked up when the builder arrived at Jim’s office. After cordial greetings and a little small talk, the builder explained how he did his cost breakdown. He handed us one copy of the cost breakdown with all the amounts listed on it. The three of us had to shuffle the paper back and forth to look at the prices. We quickly noticed that the majority of the line items were material and/or labor allowances. There were a few fixed prices, but the majority of the items were allowances. Once I figured that out and could get my hands on the sheet, I immediately tried to focus on the items I knew our prices from bidding out. The line item allowance for carpet, tile, and hardwood was half the price of what we had already picked out. I mentally added the extra amount to the builder’s total. I saw that he had a material allowance for light fixtures and ceiling fans. Really? 😕 We had already purchased all our light fixtures and ceiling fans and all were listed on our spec document. I mentally subtracted that allowance. Bill zoomed in on other line items that were his expertise. He noticed that the insulation that was listed wasn’t the type he wanted. There were other things but there was no way to compare apples to apples until after we got home and could pick through this cost breakdown and the fixed quotes he gave us and compare them to our bids. We told the builder we would get back with him with our decision probably by the end of the week. In the back of my head I was thinking maybe we should wait five weeks to get back with him. 👿 But, those grains of sand were dwindling away and our house was not going to get built without making a decision soon! Up Next: The “mover” adventures; saying goodbye to Goldie; and deciding if we would just build a shack . . . or not! The rain finally stopped! And construction on the rest of the pole barn started up again. I went out of town with my sisters on Sunday, July 7, and returned on Wednesday, July 10. While I was gone, they finished the barn! Well, all except the cupola. That is being installed tomorrow, Monday, July 15. Bill sent me pics via text to keep me updated. Bill decided to seal the concrete at the last minute. Sure glad he did. It looks so nice and shiny and he said it will help if moisture would get into the barn. 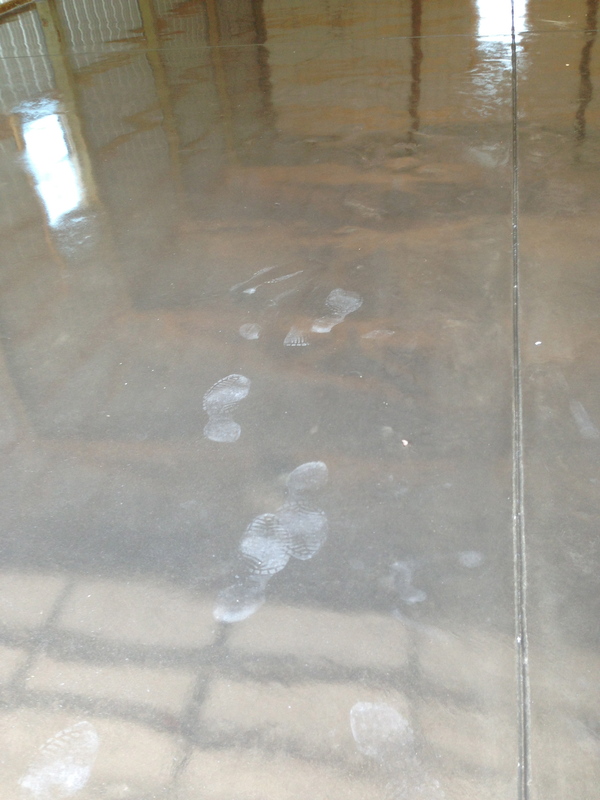 But dust (especially rock dust) on shiny new floors leaves a not so nice trail. Guess who these foot prints belong to? Bill also sent me this video via text. First time he was going to have garage door openers on a pole barn. He had to manually open and close the big garage door on the pole barn at our other house. He was happy! Okay, now to tell you what I meant by being in a holding pattern. After Jim got back from Africa and I got back from my sisters trip, we sat down and talked Wednesday night about the house. Jim had gone through our construction binder and contractor bids spreadsheet. He wanted to make sure we knew some of the reasons why the price was high. Apparently we have expensive taste in some areas. Who knew? 🙄 However, those areas were ones that Bill and I did not want to change. We still wanted the granite (including putting it on the bathroom vanities); we still wanted the front door we picked out along with the wooden casement windows; we still wanted the stained trim package, the coffered vaulted ceiling in the family room, the hardwood floors, upgraded carpet for bedrooms, and the high-efficiency fireplace. I’m sure there were more things, but those were the prime ones. This is our last house we will own. We wanted it the way we wanted it. The topic came up of whether we should talk to a custom home builder. Jim wanted to know if we wanted him to meet with a builder and ask if he would be interested in giving us a price to build the house instead of us sub-contracting out the whole thing. We were open to the idea. Bill asked if we could be present at that meeting. Jill shared which builder she felt would be our best match and who would not be a conflict of interest for Jim’s family engineering firm. Jim said he’d call the builder the next day. At this time I’m not going to share the builder’s name as we don’t know where this will go. To our surprise (me and Bill), the builder was not scared off. Jim asked if this might be an opportunity for the builder to take on. He said he would be happy to take a copy of the plans and specs and give us a proposal in 2-3 weeks. 🙂 This is where the holding pattern comes into play. We have decided to wait and do nothing more on the house and the house bids until we hear back from the builder. Bill and I have decided that if the builder’s price is equal or below our bids, we will definitely let him take over the job. That will save Jim all the time and energy of being the general contractor. It will also relieve Bill from being the on-sight “eyes and ears” for the build. Well, we’d probably still be “eyes and ears” but in a more behind-the-scene way. Either way, Bill and I have agreed that we are going to build the house as we want it. So, in the meantime, I’m praying again for God’s guidance along this path. Since we have a couple of weeks of reprieve, Bill is starting to work on the pole barn interior before he brings the cabinet parts down from the storage unit up north. 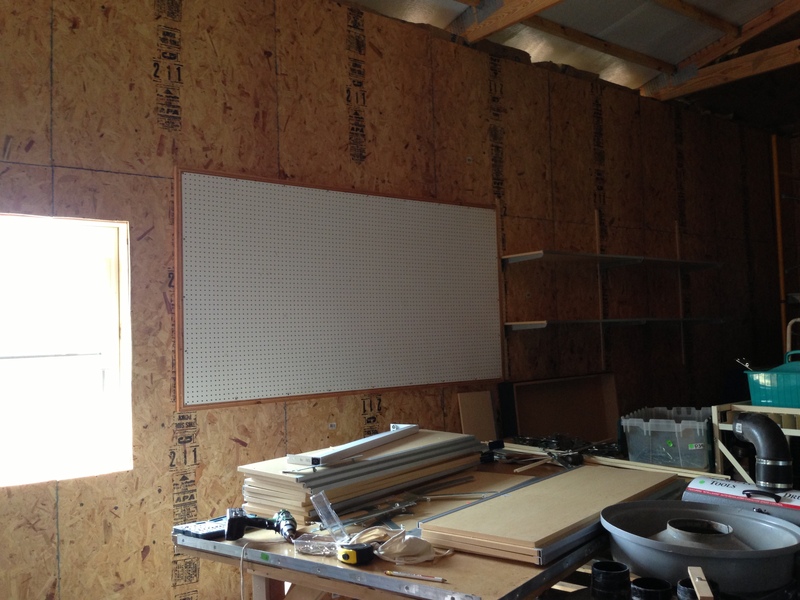 Maybe he’ll be able to get the walls and insulation up BEFORE he sets up the workshop. He was thinking he would have to do it afterwards. I’m hoping this delay will all work out for the best anyway. My time lately is being spent being the laundry fairy and dinner chef. If it were up to the grandkids we’d have spaghetti or tacos every day. I need to look though my cookbooks and come up with some other summer-friendly recipes the family might like. Oh, before I go, I have two more pictures to share. The big cupola came in and we got to see it when we dropped off our last payment for the pole barn. That sucker is going to be big! The grids on the windows of the cupola were white – not really part of the color scheme. Bill decided to paint them bronze since the other part of it was the clay color of the barn. Bill spent yesterday taping up all the square areas and spray painting the grids. They turned out really nice. 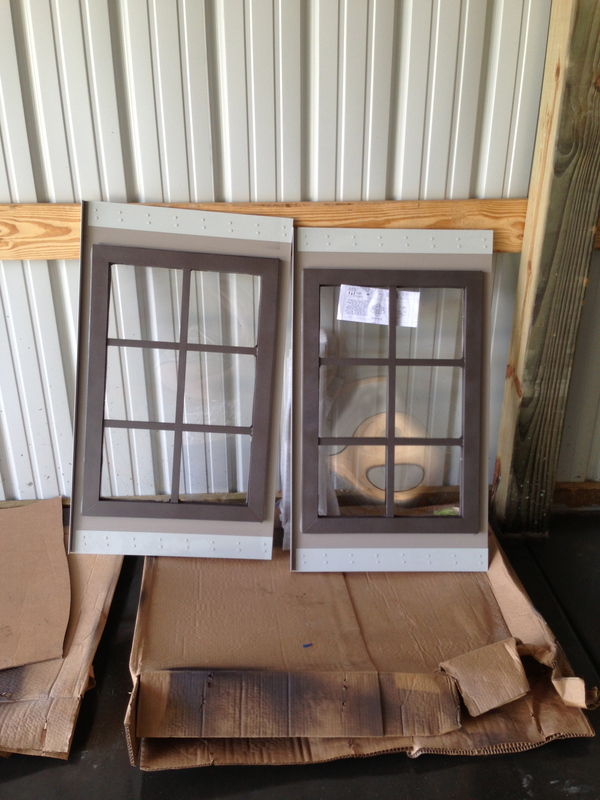 Here are two of the four windows that fit in the cupola. I can’t wait to see what it looks like on top of the barn! 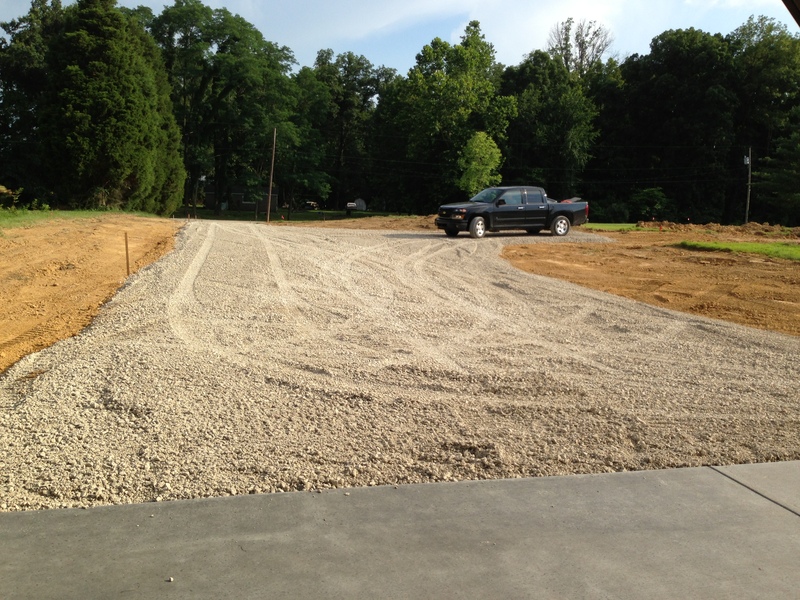 The second picture is of our driveway. The excavator dumped and spread the rest of the rock for our driveway and the area toward our garage. Bill wanted this so we can drive up the driveway now. 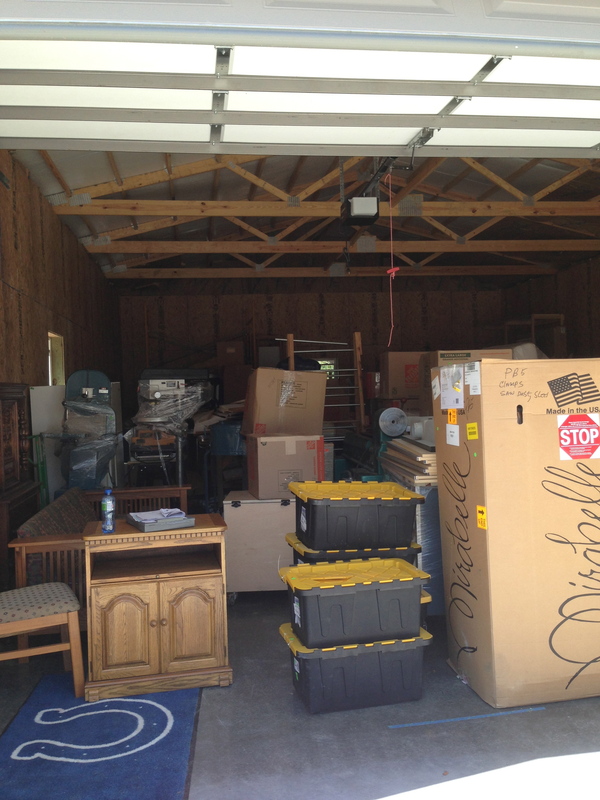 Also, when Bill is ready, we can have the moving company bring our stuff from storage! As soon as I have more news, I’ll post. Until then . . . say a prayer that the builder comes in at a good price!